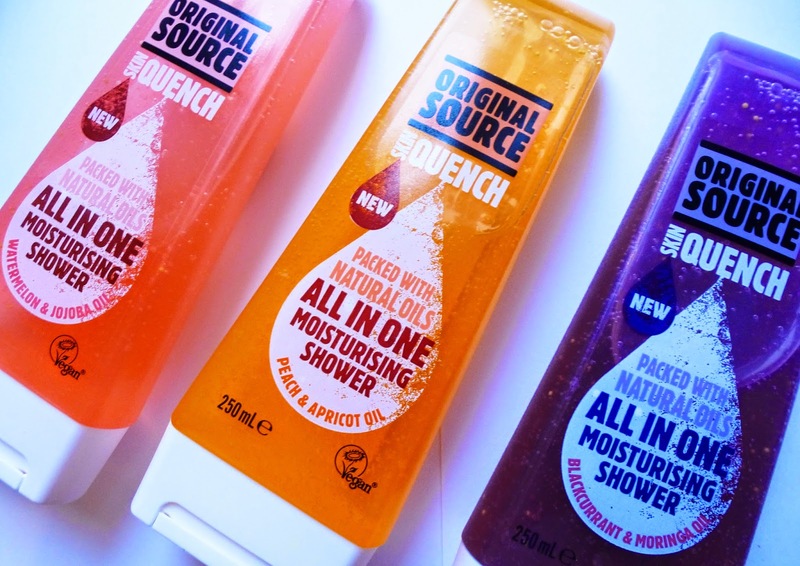 Today I am going to be talking about the ‘fairly newish now’ Original Source Skin Quench Range! It contains natural oils, with little soft oil beads as well as 100% natural fragrance and is VEGAN! I am an absolute lover of shower gel. I am really not sure what my obsession of it is…. I currently have 9 different ones… including Lush Snow Fairy OF COURSE. I especially love a good fruit scent, which is why I LOVE original source, the lime one is beautiful. Anyway back to this range, I popped into Boots last week and saw that these beauties were on offer! HALF price! So they were £1.35 rather than £2.70. (They still are on offer by the way) I have had my eye on the watermelon ‘flavour’ for a while now, so thought I would snap it up whilst on offer!!! So I originally only had the Watermelon one… but this week I ended up buying another watermelon as well as the peach and blackcurrant! The blackcurrant one is lovely lovely too, it smells like a blackcurrant fruit pastille which is quite often everyones favourite! (I like the green ones the most) I just used this one, so I am proud to admit I smell like a fruit pastille. I haven’t used the peach one yet, but I am sure it is lovely lovely!! I am not sure if I have noticed any difference in the finish these have had on my skin yet, but they are worth it for the scents, they are cheaper than the originals at the moment anyway!! Have you tried this range? What did you think of it? Next Post My Lush Haul!